This Chicken Chili Recipe post was updated with new pictures and tips 1/17/17. Barefoot Contessa’s Chicken Chili Recipe is a great comfort food and a twist of traditional chili. As many of you know I am part of a blog, BAREFOOT BLOGGERS that tests Ina Garten recipes. This month we have a challenge to do 5 predetermined recipes in a week. The first one I accomplished was the Chicken Chili. 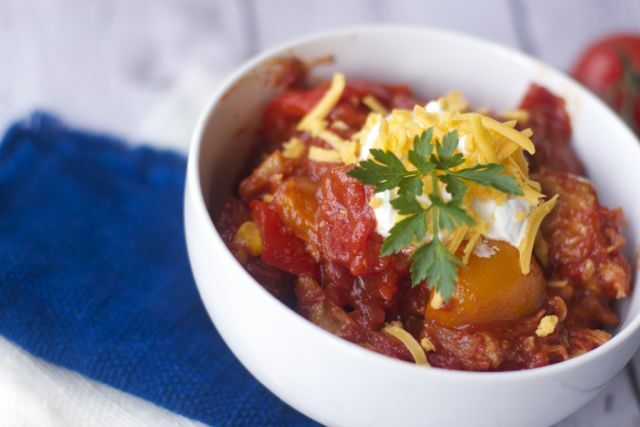 With the temperatures going down we all crave chili in our house. I have never made a chicken chili before so I was a little skeptical but knew that I have found very few Barefoot Contessa recipes that I did not like. I had many of the items in my pantry already, except I only had skinless/boneless chicken breasts as well as a few green peppers still in my garden. I roasted the chicken per the recipe just cut the time down. When I made this the second time, I used bone in chicken breasts and roasted a few extra chicken breasts to add to my Cheddar Corn Chowder the same week. 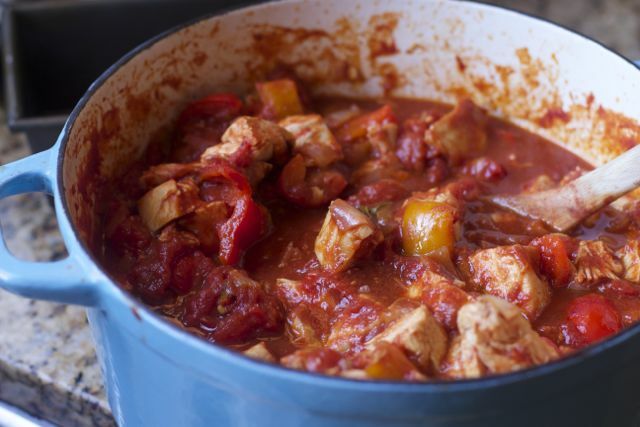 Make this chicken chili in a large dutch oven. We also vamped up the spices the second time we made this Barefoot Contessa Chicken Chili recipe. Chili to me needs to have a bit of a kick and the original recipe did not do that for us. This chicken chili recipe, even halved, makes a lot of chili. Plan on having plenty of leftovers to enjoy throughout the week. 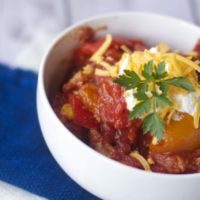 When you are ready to serve this comforting chili recipe, be sure to have plenty of sour cream, cheese and hot sauce for your guests to flavor it to their liking. Everyone in the family enjoyed the Chicken Chili Recipe, and I will definitely do it again. 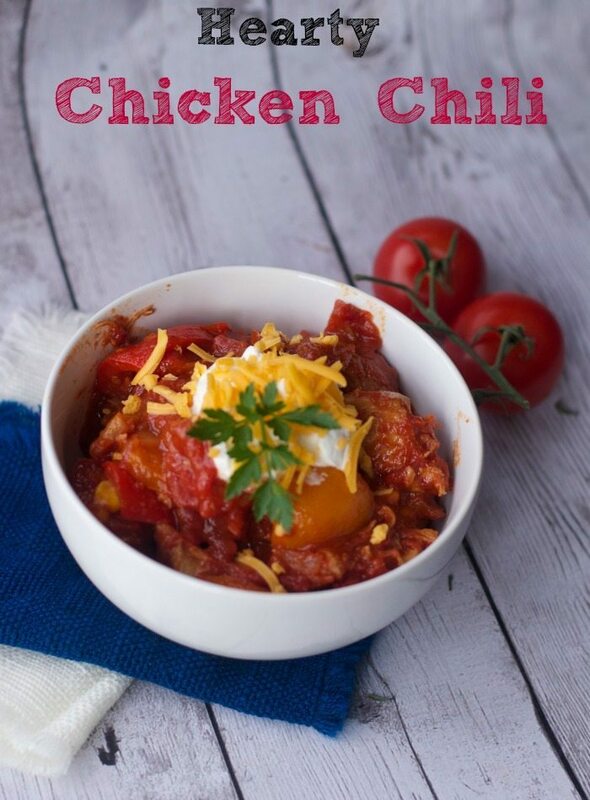 A tomato based chicken chili recipe. 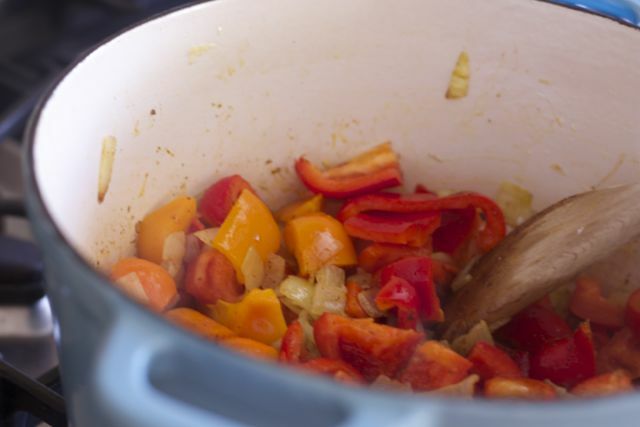 Warm up the oil in a large stock pot or dutch oven. Cook the onions in the oil over medium-low heat for 10 to 15 minutes, until translucent. Add the garlic and cook for 1 more minute. Add the bell peppers, chili powder, cumin, red pepper flakes, cayenne, and salt. Cook for 1 minute. Mean while Crush the tomatoes by hand with a scissors or in batches in a food processor fitted with a steel blade. Add to the pot with the basil. Bring to a boil, then reduce the heat and simmer, uncovered, for 30 minutes, stirring occasionally. 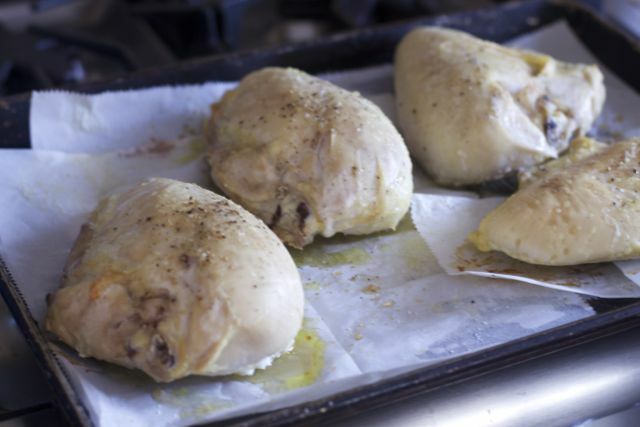 Rub the chicken breasts with olive oil and place them on a baking sheet. Sprinkle generously with salt and pepper. Roast the chicken for 35 to 40 minutes, until just cooked. Let cool slightly. Separate the meat from the bones and skin and cut it into 3/4-inch chunks. Add the chicken and corn to the chili and simmer, uncovered, for another 20 minutes. Serve with the toppings, or refrigerate and reheat gently before serving. 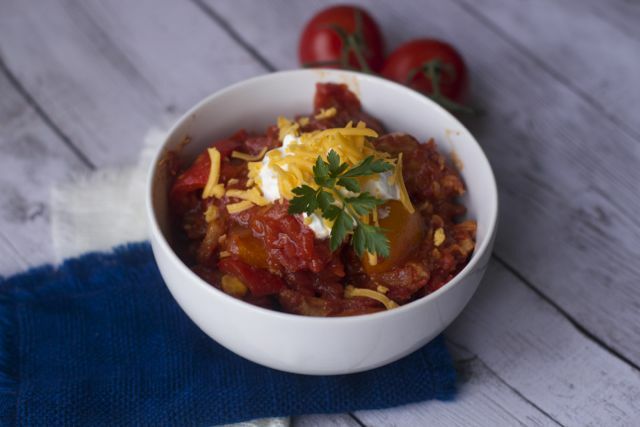 What would you add to this Barefoot Contessa’s Chicken Chili Recipe? Do you like beans in your chili? I am so happy that I located your site. I continually have a problem with fresh recipe ideas. We have my dad and mom heading over next week end so I have been hunting for a little something special. it a go. Thank you for the great idea.